16 August 1945. Upon hearing of the Japanese surrender, forced labourers in North Borneo begin slowly working their way back home to Java. Elsewhere across the vast extent of Japanese-occupied Asia, tens of thousands of people drafted into supporting Japan’s war effort take their futures into their own hands and slip away from their masters. Many more must await repatriation after Allied troops arrive; they are stranded too far away from home. The fate of the many ‘comfort women’ forced into military brothels is also uncertain. 16 August 1945. 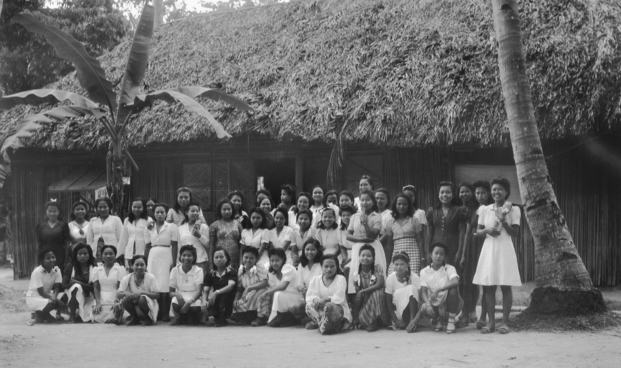 Immediately following the all-country conference of the Indochinese Communist Party in Tan Trao, about 60 delegates gather there to establish a provisional government. The congress is under Viet Minh leadership but Viet Minh–ICP linkages are downplayed. Few delegates are aware that Ho Chi Minh, who takes a leading role at the congress, is the legendary Comintern agent and ICP founder, Nguyen Ai Quoc. They elect a Liberation Committee chaired by Ho, endorse the Viet Minh banner as the national flag, and adopt Van Cao’s ‘Advancing Army’ march as the national anthem (the last two decisions subsequently challenged by nationalists). The congress ends quickly so that everyone can return to their localities to take part in the seizure of power. 16 August 1945. Ibrahim Yaacob, a Malayan independence activist who had been in negotiations with Sukarno, Hatta and the Japanese over the inclusion of Malaya in an independent ‘Greater Indonesia’, convenes an emergency meeting of Malay activists in Kuala Lumpur. 16 August 1945. Humiliated by their failure to achieve an immediate declaration of independence, radical pemuda seize Sukarno and Hatta in the small hours, taking them to a garrison of Indonesian military trainees (Peta) at Rengasdengklok, east of Jakarta. The stalemate is only broken when Japanese Admiral Maeda Tadashi promises the youth leaders that he will support and protect an independence proclamation as soon as Sukarno and Hatta are returned. 16 August 1945. A three-day conference of the Anti-Fascist People’s Freedom League (AFPFL), the umbrella organization pushing for Burmese independence, begins at the Naythuyain Theatre on Kandawgyi Lake in Rangoon. With Aung San in the chair as acting president, the assembly calls for the establishment of a provisional national government and national elections for a constituent assembly after the end of the British military administration. Delegates also demand the rebuilding of a permanent Burmese Army with resistance troops and the Patriotic Burmese Forces at its core. 16 August 1945. Thai Regent Pridi Phanomyong issues a ‘peace declaration’ that renounces his country’s 1942 declaration of war against the Allies. This was against the will of the Thai people, he declares, and thus unconstitutional. 16 August 1945. Immediately following Yŏ Unhyŏng’s agreement with the Japanese, a Committee for the Preparation of Korean Independence (CPKI) is established under his leadership. With CPKI encouragement, local people’s committees are formed that gradually replace the old Japanese administration and, together with associated volunteer police forces, maintain law and order throughout the country. 16 August 1945. Although the Kwantung Army commander-in-chief orders them to lay down their arms, several Japanese divisions to continue to fight due to poor communications or outright defiance. Next day, Stalin orders his commander to continue the advance despite Japanese requests to organize a surrender. Several pockets of resistance are bypassed as the Soviets race to seize as much territory as possible before a ceasefire. Many Japanese civilians trying to retreat to the south also die, often by suicide (or killed by their parents) to avoid capture by Red Army troops. 16 August 1945. A machine-gun-wielding assailant assassinates Ch’en Shou-ming in Bangkok, in apparent retaliation for Ch’en’s role in overseeing cooperation with the Japanese during the war. The attack comes as Chinese in Bangkok celebrate Japan’s defeat by flying the Nationalist flag, setting off fireworks and parading in the streets.